Synopsis (via Goodreads): Not every mistake deserves a consequence. Sometimes the only thing it deserves is forgiveness. DNF after the first hour of the audiobook. I actually tried to listen to this one twice, but it just wasn't working for me. I didn't connect with Merit, and I thought the family dynamics were a little too strange. The mom lived in the basement, the dad and his new wife shared a room upstairs, and they all lived in an old church that was purchased out of spite... even the sibling relationships seemed off. Merit was able to miss school and what... no one noticed? Sleeping and looking for trophies seemed like a poor alternative to going to school. The school made a phone call that was briefly mentioned and never addressed, but it seemed like a lot went unacknowledged in this book. A living, breathing person moved in and Merit didn't notice for an entire week. I really thought their mom needed help, or someone to talk to that wasn't online or related, and staying shut away in the basement seemed wrong. I understand that she had a legitimate problem, but that means she needed assistance and not avoidance. I've heard so many wonderful things about Colleen Hoover and her books, so I don't want to give up on the author! I just couldn't finish Without Merit. If you have another suggestion, let me know! If you would like to read a more positive review, check out Jessica's (Peace Love Books) review on Goodreads! Synopsis (via Goodreads): Here is a thing everyone wants: a miracle. All the Crooked Saints started out okay. There are three people driving around trying to boost their signal for their personal radio station (and avoid detection by the police), but as soon as I started to settle into their rhythm and learn their personalities, I was in someone else's head. Then another and another... it was like the perspective bounced around without a reason and definitely without warning. I never really knew where I would be next. Aside from that, I didn't really relate to these characters individually. I was never with any one person long enough, but they also didn't stand out. I may have felt differently if I had kept reading this, but maybe not. Maggie is always so creative with her books and their settings, and I wish I had been able to like this one more. 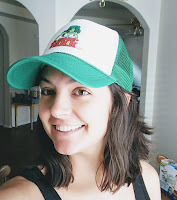 Get a second opinion from Brittany over at The Book Addict's Guide! Synopsis (via Goodreads): Five siblings fall through time and space into a strange, unkind world -- their arrival mysteriously foretold -- and land in the center of an epic civil struggle in a country where many citizens have given themselves over to their primal fears and animal passions at the urging of a power-hungry demagogue. When siblings Susan, Max, Nell, Kate, and Jean tumble one by one through a glowing cobalt window, they find themselves outside their cozy home -- and in a completely unfamiliar world where everything looks wrong and nothing makes sense. Soon, an ancient prophecy leads them into battle with mysterious forces that threaten to break the siblings apart even as they try desperately to remain united and find their way home. Thirteen-year-old twins Max and Susan and their younger siblings take turns narrating the events of their story in unique perspectives as each of the children tries to comprehend their stunning predicament -- and their extraordinary new powers -- in his or her own way. From acclaimed author Adina Rishe Gewirtz comes a riveting novel in the vein of C. S. Lewis and E. Nesbit, full of nuanced questions about morality, family, and the meaning of home. This was very similar to The Chronicles of Narnia, and even had it's very own Susan and Lucy (though the two are not related in this book). 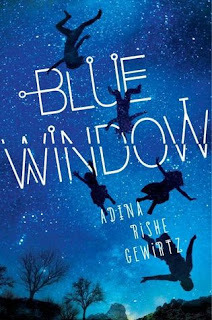 Blue Window is about a group of children (siblings) that fall into another world via a window. This new place is scary, unexpected, and filled with... I don't know what, because I didn't get that far. I know I didn't read much of this book, but I had a lot of trouble separating the different characters. I also kept getting confused and had to re-read certain parts to figure out what was going on. One minute they're at the kitchen table eating breakfast (there were a few things going on), and someone mentions going to school. The next sentence everyone is already home from school and doing various activities. Where are their parents?? They're mentioned a few times, and the mom shows up with orange juice once, but then just disappears. I feel like there should have been more interaction with the children, since the oldest is only 13. It wasn't just the parents that vanished in the middle of a paragraph. The other characters seemed to flutter around without a purpose, too. I really loved the synopsis for this one, but I just could not get into it. The random additions from an exile, or the exiles, were odd and didn't seem to fit with everything else. I'm sure that perspective would have tied in later, but I was already confused without trying to decipher their cryptic words. The flow of the story was weird, the way the information was presented was confusing, and I didn't connect with any of the characters. I did like Susan's fondness for words, but their application to the story seemed forced. I might look for this book once it's published, because maybe these kinks were ironed out after I received this review copy. It just had such a promising, interesting concept. I'm still a little curious about where they landed, and what's going to happen to them, but not enough to read it as it is. If you want to read another review, try Jackie's on Goodreads! I've tried a few Colleen Hoover books... they're definitely not for me. I'm going to try another one to see if it was just this book. I just don't know which one to try, lol. Sometimes we don't enjoy something, and that's okay. The world is full of different people that like different things. It's great! Maggie is a a miss or hit for me too. Sorry you didn’t enjoy these. No worries! I've loved the last few things I've read. There's always something else! Which of Maggie's books did you like? I know people LOVE CH but I've never been able to get into her books. I know people that RAVE about her constantly. It's why I wanted to try one of her books. I'm willing to try another one, just in case this one was a fluke, so we'll see what happens! Very interesting. 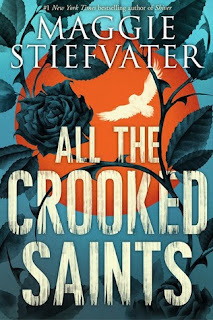 I loved The Scorpio Races and was only luke warm about the Shiver series and The Raven Cycle so maybe I’ll love All The Crooked Saints. Haha! Opposites! If you end of loving All the Crooked Saints, let me know! I haven't read any of these. We aren't always gonna like all the books we start out to read. I agree! That's the beauty of reading...there's always something else! We might have completely different tastes, so all I can do it explain *why* something didn't work for me. I thought it had a lot of potential, but it just wasn't there yet. I just really liked the concept for this one, so I was disappointed when the issues outweighed my curiosity. I liked Without Merit but didn't love it. Agree with your issues though. I still haven't read any Maggie Stiefvater yet. No Maggie? Like, at all? I HIGHLY recommend The Raven Boys (and the rest of The Raven Cycle)! It's one of my favorites! Without Merit was just too odd for me. Have you read any of her other books? I always get a little sad when a book doesn't work out, but then I move on to the next book! I've never read a book by Hoover, but I do want to try one. 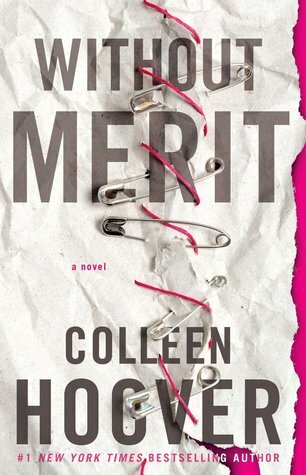 I feel like Without Merit is one that I haven't seen a ton of great reviews for, so maybe another one by her will work better for you. I loved The Raven Cycle books, but I haven't read everything by Maggie. I'm curious about Crooked Saints, but again, I've heard mixed things. The Raven Cycle is amazing. I want to re-read it soon! No Hoover for you either? I'm trying to find someone that's a fan and can recommend their favorite book by CoHo. I actually have SO MUCH trouble with Colleen Hoover's books. I tried to read I think 3 or 4 of her books, and I hated them all. xD The characters were always so typical, and the plots were always so meh. It honestly sounds like she tried too hard with Without Merit. It definitely sounds strange, and unless all of those characters are mentally unstable, I won't be able to deal with it. I'm sorry to hear you DNFed Crooked Saints--I read the first Raven Cycle book and thought it was alright, but I hated the first Shiver book, and I've been meaning to read more from this author! Without Merit was my first CoHo book, and I was bummed when it didn't work out. People rave about her all the time! I'm going to try reading one of her other books. I was upset about not finishing All the Crooked Saints, too. I love how imaginative her writing is, and she always tells a unique story. TRC is one of my favorites! I've heard so many wonderful things about Colleen Hoover and her books! What would you recommend I try, since she's one of your favorites? I'm always willing to try other books by the same author, but Without Merit wasn't for me. It was too weird and the story was off-putting. Maybe it will be better for you! I sure hope so, Lindsi! I've yet to read one by her that I out and out disliked. The first one I ever read by Colleen Hoover was Maybe Someday and it remains one of my favorites. Another favorite is It Ends With Us. Ugly Love and Confess were also very good (even though Confess is a bit insta-lovey). If you decide to give her another try I sure hope it'll be a better experience! I'll try Maybe Someday! I saw an audiobook for it at my library (I think). I'll let you know how it goes. 😁 Thanks for responding so quickly! I was genuinely curious about which one of her books to try next. Ugh, I hated Merit's dad. Her stepmom seemed overly angry, too. The twin sister (her name eludes me...) also seemed harsh and unforgiving. I know that some books that don't work for me will be loved by others, and I think that's great! I'm so happy you enjoyed Without Merit. Did you love another one of her books and want to recommended it? I feel the same way about the books I've been reading this year. I'm either all over it, or just not feeling it. There really hasn't been a middle for me either. Which of Colleen Hoover's YA books would you recommended? People have rec'd a few already, but I want to know what you think! I liked Shiver and Linger by Maggie, but the second half of the series wasn't as awesome for me. I'll always try her books, because I love their uniqueness. I never know if it will be a hit or a miss, but I'm willing to try!